UPDATED: Sat., Aug. 18, 2018, 6:43 p.m.
MOSCOW, Idaho – In a glass half-empty or half-full scrimmage Saturday for the Idaho Vandals, the offense couldn’t run and the defense couldn’t cover the pass. Conversely, the passing game clicked and the defense was stout against the run. Quarterbacks Mason Petrino and Colton Richardson combined to throw for 10 touchdowns. Petrino tossed eight, completing three to Connor Whitney and a pair to Cutrell Haywood, who also caught a Richardson pass over the middle for a score. “(Haywood) had a great day,” Vandals coach Paul Petrino said. “When there are live bullets flying, he scores touchdowns. Most of the scores came on drives that started from the 30-yard line or closer. Playing on a long field, though, freshman running back Carey Conlan looked like he might get the ground game going with a 10-yard gain near midfield that featured a big second effort. But on the next play, Conlan injured an ankle and had to be helped off the Kibbie Dome turf. The other rushing highlight occurred on the final play when freshman Tyrese Walker got his 165 pounds under the pads of freshman linebacker D’Andrei Pittman at the 1-yard line and bulled his way to a touchdown. For the majority of the workout, however, Isaiah Saunders and Jack Bamis were met almost constantly at the line of scrimmage, as the offensive line was unable to generate momentum. Roshaun Johnson, who also figures to be a big part of Idaho’s running attack, was injured and did not play. 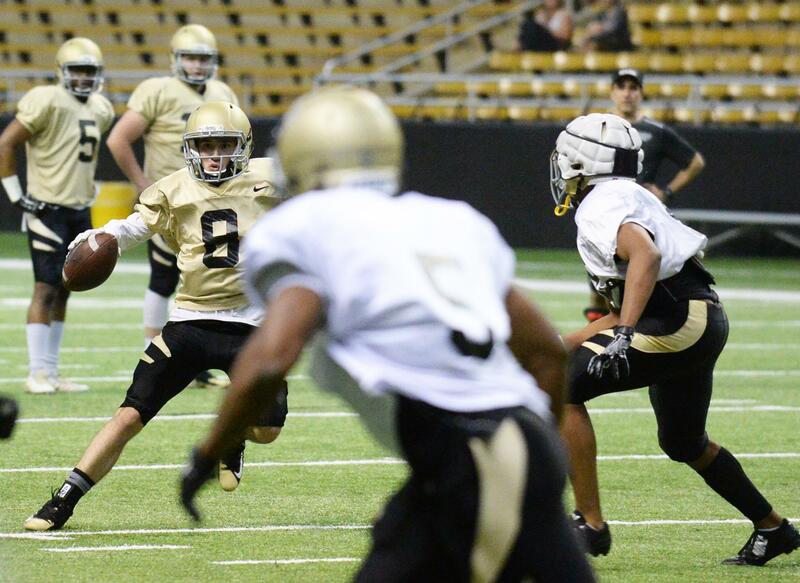 Idaho coaches continued their experiments with two-way players Kaden Elliss and Whitney. Those two lined up in a two tight end set that resulted in a Whitney touchdown from Petrino. They also played with Whitney as a tight end and Elliss as a slot receiver. The true slot receivers also had their moments. Senior David Ungerer made a diving reception in the corner of the end zone to avoid safety Jalen Hoover on Petrino’s 20-yard throw. On what may have been the best play of the scrimmage, Richardson zipped a throw into the tightest of coverage on the sideline, and junior Josh Ellingson plucked it off Pittman’s hands. Pittman leaped in frustration. “Colton threw that ball to me and I didn’t even know anyone was there. I was concentrating on the ball,” Ellingson said. Ellingson is also the Vandals’ field-goal holder, but he may be playing himself out of that position and into the receiver rotation. “I’m working every day to get in there,” Ellingson said. “I’ve been here four years. Paul Petrino saw enough from his quarterbacks to strengthen his belief that there is room for both to play, especially early in the season. Petrino won’t confine his speculation about playing two quarterbacks to having them alternate halves, quarters or series. The way they worked in the scrimmage could foreshadow the way they operate in games. “You could see them rotating on plays,” he said. Published: Aug. 18, 2018, 5:42 p.m. Updated: Aug. 18, 2018, 6:43 p.m.